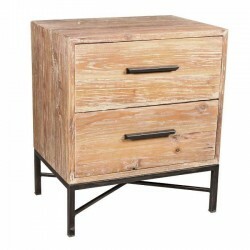 Combining the rustic charm of natural wood with industrial iron, this Elegant Reclaimed Wood 1 Drawe.. Combining the rustic charm of natural wood with industrial iron, this Elegant Reclaimed Wood 2 Drawe.. This mirrored nightstand reflects exquisite taste furnishings. Mirror inlays adorn the top, front an..